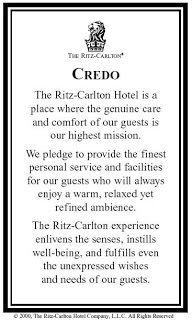 My husband carries a Ritz Carlton credo card in his card case. No, he doesn’t work for the company and he never has. 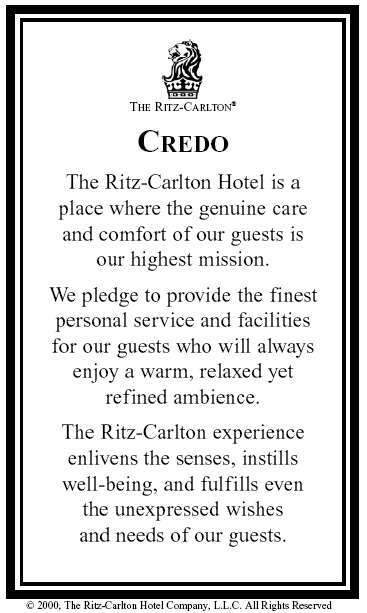 Moe, a particularly helpful staff member at the Ritz Carlton Georgetown gave it to him recently after we had a conversation with her about how much we love the Ritz Carlton company and how their credo should be applicable to all customer oriented businesses. In a world where customer service is often lacking, the Ritz Carlton continues to set the gold standard. Their motto, as stated above, is “We are Ladies and Gentlemen serving Ladies and Gentlemen” – when you stay at one of their properties this is readily apparent. Whenever we travel to a city where there is a Ritz Carlton, it is without a doubt our first choice. 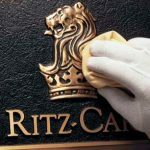 While the Ritz Carlton properties may tend to be a bit more costly than an average hotel room, they are usually priced very competitively with other five star hotels. 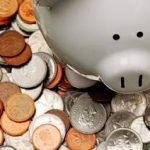 On many occasions while traveling with our children we have found that booking a large suite at a Ritz Carlton is actually more cost effective than booking two rooms at a lower end hotel chain. They also often have great package deals. With the Ritz Carlton Rewards program, free nights can be earned quickly as well. Once upon a time, my husband and I set out to stay at every Ritz Carlton in the world. However, the company began growing like crazy so our ambitions were quickly outpaced by all their new hotels. We are still working on that goal, although with 79 hotels in 26 countries, it may take us quite a while. At last count, we have managed to stay at 24 of their properties, including three of the Ritz Carlton Destination Clubs (fractional ownership properties.) We honeymooned at Kapalua, have been to Cancun eight times, St. Thomas three times and hope to become regulars at Georgetown now that our daughter has moved to DC. 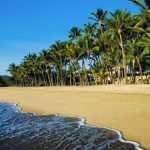 Unfortunately, they initiated the Ritz Carlton Rewards program only a couple of years ago so many of our visits didn’t count towards rewards, but we are working hard to build our points now. Why exactly are we such fans of the Ritz Carlton? Simple – it all comes back to the service. Today’s society is increasingly becoming more and more aggressive and self-centered and it is a pleasure to travel somewhere and be treated with genuine kindness and sincerity. At the Ritz Carlton, the service never seems affected – the employees clearly love their jobs and love working with their guests. “My Pleasure” is always the response to even the most mundane request and one senses the staff truly means it. I recently read a wonderful article that pretty much says it all about Ritz Carlton’s legendary service – a young boy left his beloved stuffed giraffe, Joshie, at the Ritz Carlton Amelia Island. It is good service to put the toy aside and mark arrangements to return it; it’s Ritz Carlton service to take photos of the toy “on vacation” all over the resort and return him with a photo album filled with pictures of “Joshie at the Ritz“! Thank you, Ritz Carlton, for your always reliable and impeccable service!